Kath and her needlework group TGIF (Thank Goodness It's Fiber) are preparing to teach a workshop at the Holston Homeplace Living History Farm, but their lesson in crazy quilts is no match for the crazy antics of the assistant director, Phillip Bell. Hamming it up with equal parts history and histrionics, Phillip leads an archaeological dig of the farm's original dump site -- until one student stops the show by uncovering some human bones. 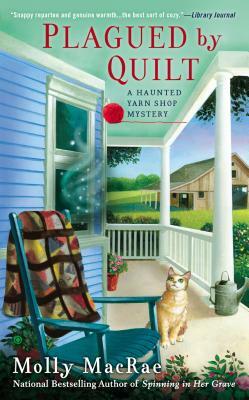 When a full skeleton is later excavated, Kath can't help but wonder if it's somehow connected to Geneva, the ghost who haunts her shop, and whom she met at this very site. After Phillip is found dead, it's up to Kath to thread the clues together before someone else becomes history.